It's so difficult when a child doesn't eat as well as you would like them too. You have this picture of a family sitting down to eat together, children happily munching the vegetables you have lovingly prepared to nourish their little bodies. Instead you feel like you are entering a battle ground, frustration mounting as you try to persuade them to eat just one pea. Good food is so important, you feel like a failure for not getting it into them and try convince yourself it isn't personal with every wasted dinner that goes straight into the bin. Luckily there are some things that can help, and they may well be things you have never tried! With just a few changes I have helped many fussy eaters to become keen eaters, one parent even joked that I must have used hypnosis! 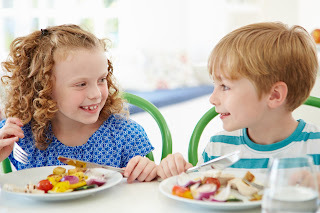 Here are my top tips for peaceful mealtimes. Serve a small amount of food. It's easy for a little one to be put off by a big plate of food, and if they do finish a smaller portion they can always have seconds! Serving a small amount also lets your fussy eater have the satisfaction of telling you they ate it all up, which will motivate them for next time. Cut the food into little pieces. Many fussy eaters don't like to have their mouth too full, cutting the food into smaller pieces than usual lets them eat more comfortably. Have family mealtimes. If at all possible sit down and eat together, all eating the same foods. Children learn from your example and will want to eat whatever they see you enjoying. Avoid distractions. Turn off the TV, put toys away and sit together at the table. Children need to engage with the food in front of them, which they can't do if Mum pops a spoonful in while the child is absorbed in postman pat. Have real conversations. Avoid talking about eating, who has eaten most or begging your child to eat. You might mention how nice the food is, or that carrots are your favourite, but keep it brief before moving on to other topics. Take the pressure off. Try not to spend mealtimes watching your fussy eater, instead turn your attention to other family members. Even praise can be off putting if it's over done so try not to applaud wildly at the first bite. Instead wait until your child has had a few bites, or towards the end of the meal, then smile warmly and say well done. Remember, your job is to provide a variety of healthy food on a regular basis. Your child's job is to eat, or not, as they choose. You haven't failed if they didn't eat much, just keep offering lots of healthy foods and you will get there in the end!